My husband is going to be 40 this Saturday! Doesn't time fly! I wanted to use one of my favourite stamp sets, A Sense of Time. It's such a great set for male cards. 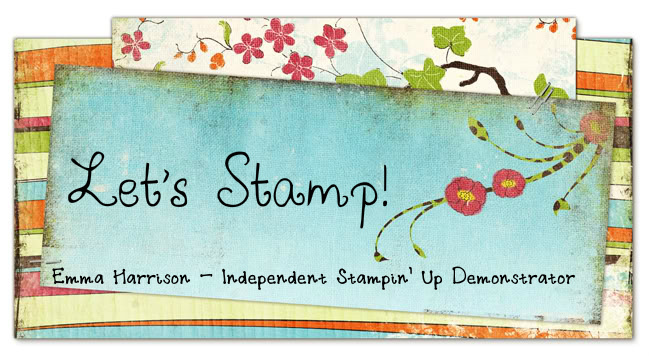 I've paired it with the distress kit from Stampin' Up! and the Square Lattice embossing folder. The Lattice folder is one of my favourites, I just love the texture it gives. It's great for distress effects but also wonderful for a basket weave! Anyway, I hope you like the end result! The lighting is not great, so you may want to click on the photo to get a better view. A more detailed description follows below. 1. Card: ink up the small cogs stamp in NN and stamp on the right hand side. 2. Ink up the Sanded background stamp in EE and stamp on to some VV cardstock. The stamp the clockface using NN and two small cogs using CC. 3. Using the flat stamp from the distressing kit, gently ink up the sides using the Blue inkpad from the kit. I did the corners first and then rubbed along the sides when there was less ink on the pad. When using the flat stamp you want to start off your card and then rub on in a circular motion. Then go around the edges again and into the middle of the card using the flat stamp and the Tea Stain inkpad (making sure you've used your Stampin' Scrub to clean the stamp first! 4. When you are happy with the distressed appearance, put it in the embossing folder and run it through your Big Shot. 5. Mount onto Chocolate Chip card and create the greeting. 6. You can then decorate the envelope using the small cog stamp! Lovely card, and very man-ish.